Wishing all our followers and visitors a very happy new year 2019. May all your dreams come true. Share your travel news/events here. My brother Vas is planning his trip to the 51st annual international I-500 Snowmobile Race in Sault Ste. Mary in Upper Peninsula, Michigan. Fellow writer and colleague Tamela Spicer is in Kenya, now. I will be going to Venice, FL in mid February. Mackinac Island, MI -As the cross-country skis swish through a foot of fresh fallen snow on a perfectly groomed trail to the Arch Rock, the heavy pine branches sweep the shimmering white blanket. A scenic view by the icy limestone rock formation uncovers the vast blues of Lake Huron and the northern sky. 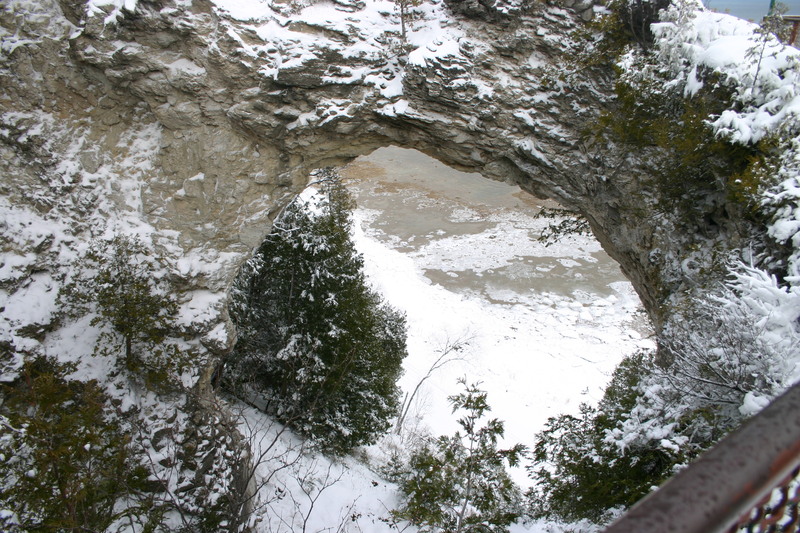 Looking down 150 feet from the observation bridge, visitors can easily spot the Lake Shore Road wrapping around the island like a snail or a silver thread. A skier emerges from the woods in the fairy tale setting. Speaking with a slight accent, M.J. explains his summer job on the island. M.J., a farmer from Zimbabwe, made Mackinac Island his home because it reminded him of Africa. He is a driver for the Mackinac Island Service Co., that operates transportation on the island. Vehicles have been banned from the island since 1898, when the first car frightened the horses. In winter, a fraction of the total 600-horse livery remains to taxi guests from the docks on the Haldimand Bay and the airport plateau to the inns that stay open. For islanders like M.J. and the Park Place Suites innkeeper Jamie Schwemin, winter is magic time, a break from the seasonal bustle of the island. Winter months on the island are dedicated to cross-country skiing, snow shoeing and chili cook-offs. There are 18 miles of classic ski and skating trails on the east side of the Mackinac Island State Park. The trails lead through the vantage points on the islands, the bluffs. The East Bluff provides the best panoramic view of the island. Below the bluff sleeps the city of Mackinac Island with the black steeple of Ste. Anne protruding into the sky. 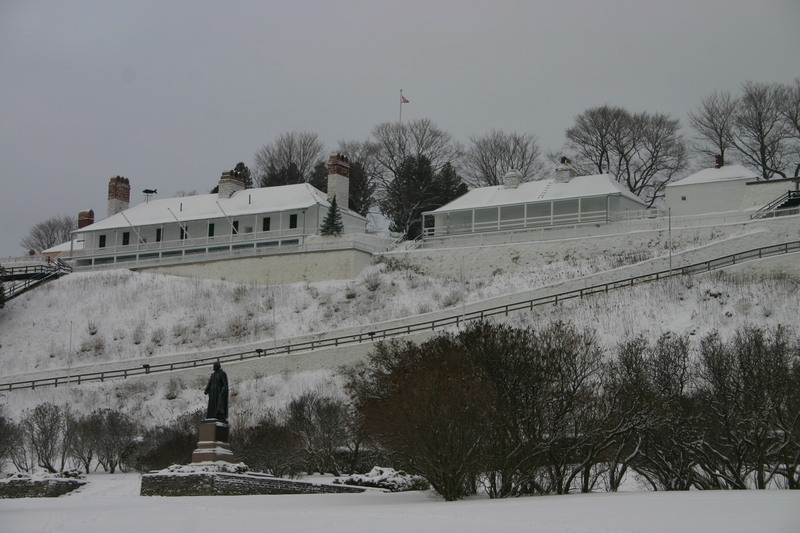 To the right, Fort Mackinac stands sentinel to the island’s history, a mix of Indian, French, English and American heritage. The Round Island Lighthouse marks the gateway to the Mackinac Island Marina. Further west out of the fog rises the almighty “Big Mac”, a suspended five-mile long bridge that connects Michigan’s Lower Peninsula with the Upper Peninsula. The East and the West Bluffs carry the magnificent Victorian cottages with elaborate stables built by Michigan lumber barons and Chicago meat packers. “The bluffs were the main reason for the settlement of the island,” said local island guru and tour guide extraordinaire Tim Leeper. Certainly, the bluffs can easily be seen from a distance aboard a ferry coming to the island from the mainland. The Arnold Line provides regular transportation even in winter. If the straits freeze, a charter plane is available from St. Ignace on the mainland. And then a horse-pulled taxi to the island’s cozy inns will make sure guests arrive to their destination. The sparse arrival or departure of a ferry on the island in winter time reminds one of bustling ports of yesterday. The significance of such an event can only be matched by the departure of “Titanic.” Everybody is there to take in the spectacle. Horses and buggy drivers along with merchants patiently await the ferry. It is customary for the local innkeepers to be waiting for their guests at the docks with sleds and carts to haul luggage. What will it bring ashore? “Welcome, are you Emma?” asked Leeper holding on to an orange and blue baggage cart reminiscent of an Oriental jinrikisha. Everything on the island is done out of pure necessity to be self-sufficient without motor power, except for the recent influx of snowmobiles. 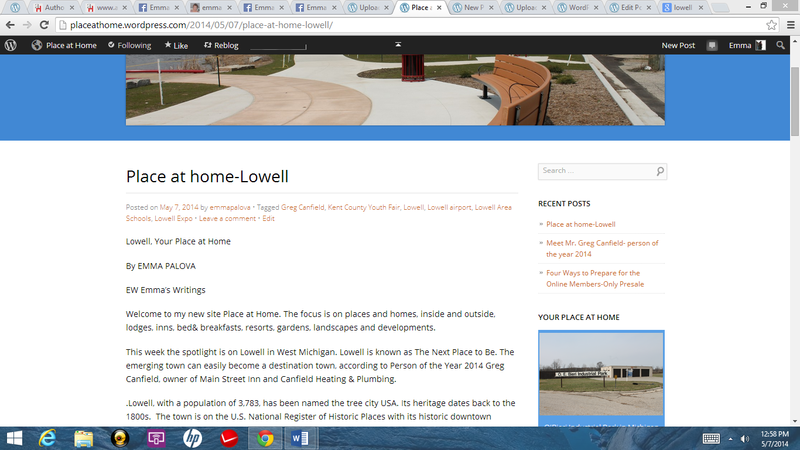 “They’re a necessity,” said Schwemin. 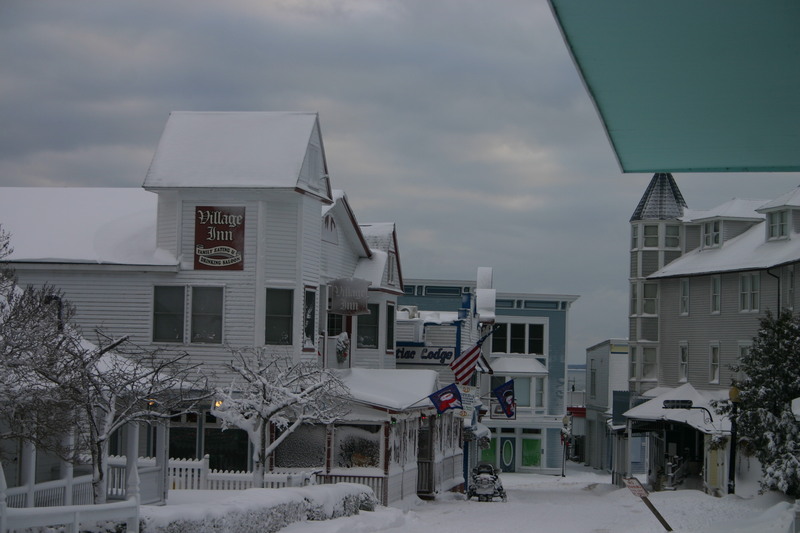 Skiing or walking through downtown Main Street, also known as the historic Harbor District, is like stepping back in time. The brightly colored facades of the mid 1800s buildings look like a movie set from Hollywood. The main island thoroughfare is an eclectic mix of hotels, pubs, shops and galleries built in Victorian style. A Russian student clerk at the Coin Shop with memorabilia of all sorts talks about living on the island. Across the street at Patrick Sinclair’s Irish Pub, it’s lively. The construction crew has just finished working on the Mustang Lounge remodel, and they are awaiting the next ferry headed to mainland. Winter time is also catch up time for the islanders to fix up everything for about one million visitors to the island every year. The Loon Feather further down west on Main Street rents skis and snow shoes. The souvenir shop carries everything from all the previous Lilac Festival posters to lilac essence soaps and diaries. The fragrant purple lilac along with fudge are the signature staples of the island even in winter time. 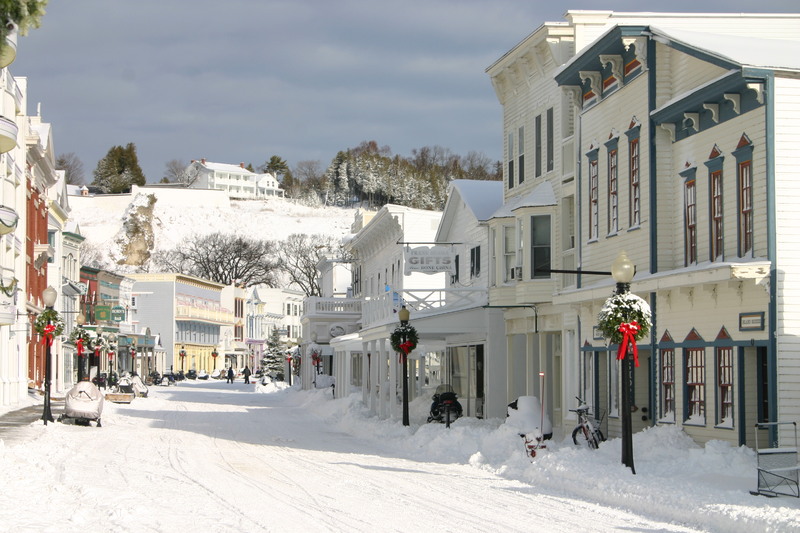 Walking inside any of the fine island establishments, one can smell the essences of Mackinac Island whether it’s the lilac bath salts and soaps available at Alford’s Drug Store or souvenir fudge in a pretty white box. Year after year, couples like Jeanne and Jim Boss of Rockford come to the island to celebrate their wedding anniversaries. The island provides an ideal setting for romance at any time of the year. True, you never know who you’re going to run into on the island. It easily can be a movie star, a neighbor or a writer. The island traditionally draws artists as well as politicians. 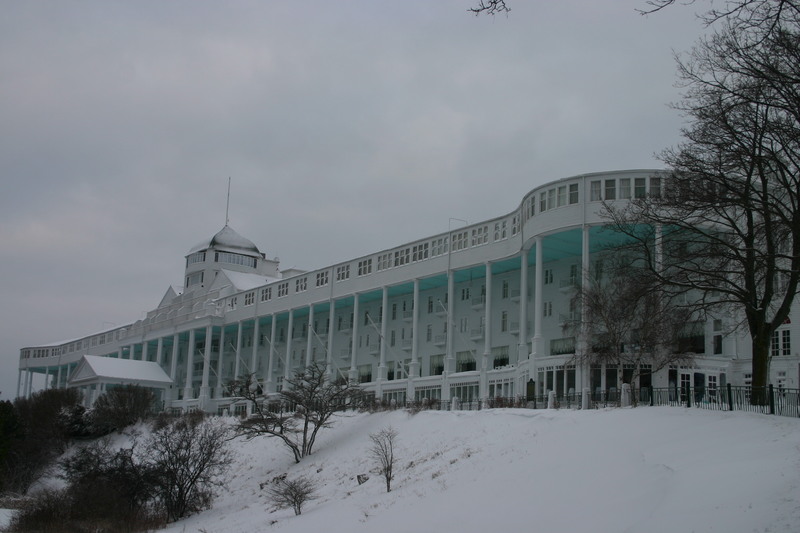 The island’s premiere landmark the stately Grand Hotel, built from white pine in Grecian style with a 700-foot long verandah, is a must see even in winter time when its closed. Its icy columns and roof are visible from the main land seven miles away. Stopping the skis at the green historical register landmark is almost like having a tour guide or a lecture from the island’s history. The Grand Hotel is a jewel on the island’s historical crown. Built by railroad companies for vacationers coming on steamers from the large cities in the Midwest in 1887, the hotel breathes elegance and relaxation even in today’s fast paced world of technology. No wonder, it served as a set for the 1980 Jeannot Sczwarc romance movie “Somewhere in Time” starring Christopher Reeve and Jane Seymour. Chilled by the wind from the straits, a stop at the cozy Village Inn back in town warms up the stomach and the heart. Chunky whitefish chowder, baked onion soup and planked whitefish are always on the menu. The town is lit now with lamps, and somewhere in the distance horse’s hooves softly clip-clop into the night. Village Inn on Hoban Street is open year round. Their specialty is planked white fish. Bundle up, it’s cold. Take your cross country skis with you even if flying. Buy Lilac Festival or Somewhere in Time posters, they make great souvenirs. 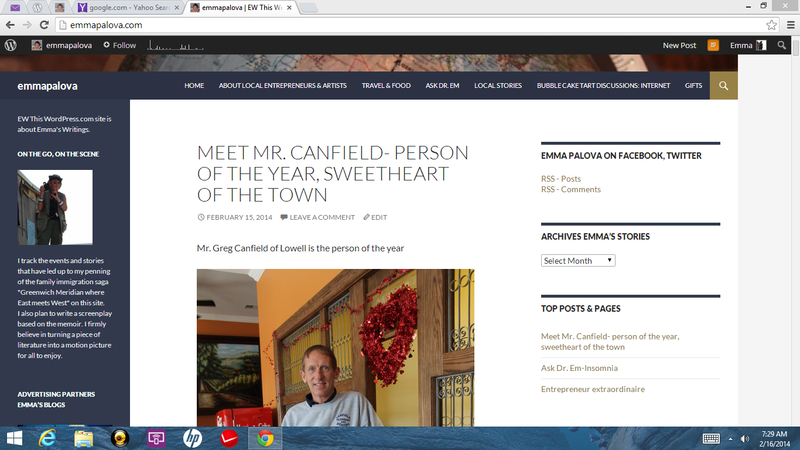 Emma Blogs LLC is an Internet company founded by Emma Palova as an advertising and design platform on her quest to publishing a book. The "Greenwich Meridian" is a memoir about the family immigration saga now spanning three generations. The memoir is dedicated to my mother Ella Konecny. Grandpa Ludek Pala time with Ella.